The fact is, the spotlight will always be on push notifications, with in-app coming in close second. There are two more channels that still receive even less attention though: location-based and inbox messages. These are two innovative and effective, yet underutilized ways to reach out to your app users. Location-based messaging (or “Geo Push”) gives marketers the ability to send real-time push notifications to users the instant they enter or exit a specific location regardless of whether they have the app open or not. Inbox messaging offers a more long form, less upfront opportunity than push; these messages are stored in an app user’s in-app mailbox (similar to an email inbox). Users can return to these messages at any time within the app. 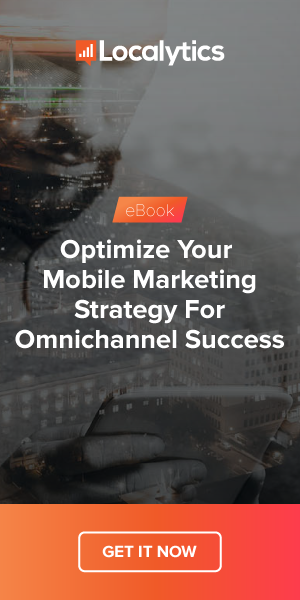 Even if these channels are not your primary marketing strategy, they should at least be considered for use as supplements to push or in-app campaigns. Our data points to noticeably higher performance in campaigns that send Inbox and Geo push messages compared to regular push notifications. Geo push is more effective than push because location-based messages target a user’s location in real time. We’ve found that targeted campaigns are the most effective, and a Localytics survey found that 42% of users say that campaigns that target them based on their location will cause them to use the app more. Inbox metrics are difficult to track because a message “open” only occurs when the user clicks on the message, then clicks on the call-to-action within the message. All of these metrics are therefore based only on users who actually opened the message to begin with. Users open geo push messages at 2.5 times the rate that they do push messages, convert 2 times more, and are 1.6 times more engaged with the message. The engagement metric here represents the number of sessions the average user completes within seven days of message receipt, while the open rate represents the number of interactions users had within one day of receiving the message over the number of messages sent. The conversion rate is calculated as the number of users who performed the conversion event out the number of users who received the message. Of course, inbox performs very well. While some of this can be explained by how the channel is measured, it’s also clearly effective since more than one-third of users who view the message in their inbox go on to convert and users who check their inbox complete sessions in app three times more than users who open push notifications. Inbox shows its true colors when we look at how apps that send these messages perform in terms of usage. Apps that send inbox messages see 50% more launches per month than the average app, while apps that send location-based messages see about a 20% lift in launches per month. The message should be clear here: regardless of how the channel is measured, users who view inbox and geo push messages are more engaged and apps that send them create more engaging experiences. All in all, these channels are highly appreciated by the most loyal users. Why not reward them? Localytics is the leading mobile engagement platform across more than 2 billion devices and 12,000 mobile and web apps. Localytics processes 3 billion data points daily. For this analysis, push, app inbox, and geo push open rates were calculated using the total number of interactions users had with messages within one day of receipt divided by the total number of message receipts. Conversion rates were calculated using total users who converted divided by total users who received messages within one day. Engagement is measured as average sessions per user within seven days of message receipt.